Unfortunately, cancer is an all too common health issue in dogs. After supporting my dearest dog Dakota through lung cancer, I learned the troubling statistic that half of all dogs over the age of 10 will be diagnosed with cancer! Besides all the physical struggles that cancer and its treatment brings, there are also so many emotions we have to navigate through: fear, worry, anger and more. The healing system of Reiki is a strong ally in the fight against cancer, not only for the dogs we love, but also for us as caregivers! The peace, harmony and strength Reiki creates within us powerfully radiates outward to help our dogs too. Whether your dog’s cancer is curable or not, Reiki can help you negotiate the many ups and downs of the healing process with grace, patience and hope. Reiki is a healing practice that can support you and your beloved dog each and every day. Healing is about becoming whole, and this is possible to do no matter what prognosis your dog has. You can fill each moment with compassion, love and positivity, and this will help create the ideal conditions for your dog to heal himself and to live well each day. Reiki will also address and heal your own fears: Reiki practice is as much about your own well-being at it is about his! Reiki offers simple meditative techniques that help us to ground ourselves. When we are grounded, we can more easily stay balanced and strong, even in difficult situations. Our dogs are so sensitive, that they will feel this balance and be drawn to us for support. A beautiful, peaceful, compassionate space that embraces you and your dog so that he can access his strong inner power to heal: this is Reiki in action. Think of how strong a heavy rock is. No matter what storm may come through or how strong the winds may blow, this rock will stand firm. A light pebble might blow away in a hurricane, just as we might become overwhelmed and “knocked over” by our emotions when we worry about our dog’s condition. If we connect deeply with the earth, there is no shaking us, and we can remain open from our hearts, in a place of acceptance, no matter what situations our dogs might be facing. Having a firm foundation also helps us to cope with the stress of our dog’s illness and remain in a place of gratitude for this present moment. Our dogs will sense our inner strength and resolve and gratefully come forward to connect with us. Find a time to sit comfortably with your dog when you are both relaxed, perhaps after a nice walk together. Close your eyes, or keep them open with a soft downward gaze. Dedicate to your dog all the peacefulness created by this meditation. Imagine you are a giant rock on the side of a craggy mountain, high up in the clouds. Imagine how heavy you are, how solid, how ancient. Place your hands so that they are palms down on your lap, and feel as if every part of your body is heavy, immoveable and ageless, just like a rock on a mountain. Feel yourself sinking into the surface beneath you. As you breathe in, imagine the breath moves from the earth, up your feet, spine, and hands, filling your whole body with a beautiful light. On the out breath, imagine the breath as light returning down your body and back into the earth. In time this breath will have a circular feeling to it, curving up from the earth and through your body and back into the earth and so on. With each breath, feel your strength, stability, and connection to the earth growing stronger. Your body begins to feel heavier and heavier. At the same time, your emotions begin to feel lighter and lighter. It is as if the closer you come to earth, the more peaceful your mind can become. Once you have created this peaceful, rooted place within yourself, simply “invite” your dog to share this space for healing. Within this space, there is perfect balance and calm, no matter what struggles are faced. Within this space, all healing possibility exists. Sit with your dog for ten to thirty minutes, revisiting the in and out breaths when needed, for focus. Signs your dog is joining your meditation for healing: relaxation and connection behaviors such as approaching you for physical contact, sitting or lying down nearby, yawning, sighing, deep breathing, falling into a deep sleep or even vivid dreaming. Through Reiki meditation, we not only ground ourselves (which can relieve our compassion fatigue and provide a calm space to support our dog) but also we create a heart to heart connection with our dogs. Reiki practice reminds us that our greatest healing power comes from our hearts! Reiki helps us learn to see and speak with our hearts instead of only with our eyes and voices (as we are used to doing). Reiki is a deeper way of being with our dogs, a new way of communicating with them. This heart to heart communication has a wonderful benefit-spontaneous healing! We can see physical and emotional improvements soon after our Reiki sessions. For our dogs who are fighting cancer, the more we can be truly present with an open heart for them, even in difficult moments, the more we can support them to heal. When we awaken the power of our hearts, we can more easily see deeper than the surface of things. In other words, we can look at our dog and see into his inner essence. Reiki helps us to see the beautiful, strong and courageous heart of our dog, which is always perfect, even amidst physical struggles. This is important for us to remember, as we can become fearful or depressed if we begin to identify our dog solely with their cancer diagnosis. Listen to your heart; it is telling you that your dog is more than his cancer! People often have certain expectations that if their animals receive a Reiki treatment all physical/emotional problems will disappear. If that were true, the world would be a very different place wouldn’t it? So we have to ask ourselves, if that is not the case, what does it mean to truly heal? In reality, our bodies are finite, and we do not live forever. Does that mean that healing eventually fails us all? Or perhaps we are missing the possibility of deeper and more profound healing: the healing of our inner spirit. We can see from the Reiki precepts that Mikao Usui, the founder of Reiki, taught. The precepts show us that true and lasting healing is not about our body at all; healing is about our state of mind. 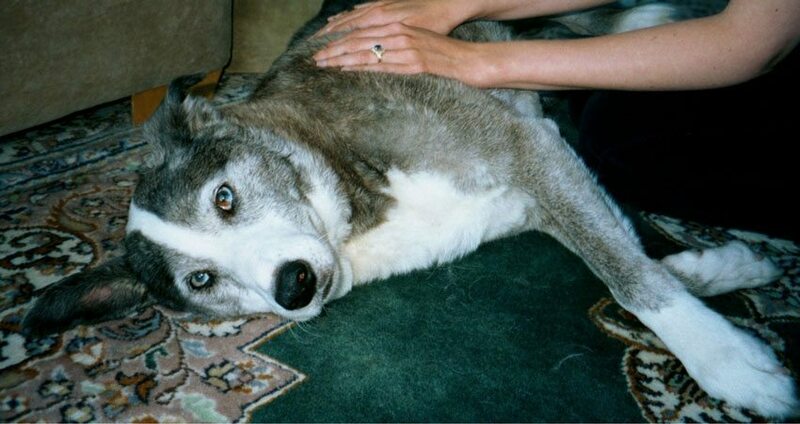 The Reiki precepts invite us to approach our dog’s cancer journey in a new way. Begin each day sitting with your dog with compassionate thoughts: contemplate, reflect, and meditate. Do not anger; do not worry. Let go of your anger at the situation; let your fears and worries float by like clouds in the sky. See deeper than the illness, deeper than his struggles. Touch hearts. Keep this heart connection all through the day. Be humble. Take time to reflect on the ways your dog is teaching you each day! End your day sitting with your dog and contemplating the compassion and love you have shared throughout the day. Reflect also on all the love he has brought to your life. Say thank you again and again to your wonderful, canine teacher. Be honest. Take time to rest when you need it, and don’t be afraid to ask for help and support from others. Be compassionate. With daily practice of the Reiki precepts, you will remember that the compassion is the most powerful healer in the universe! Even cancer holds no power in the presence of love and compassion. Let Reiki meditation guide you to rediscover the meaning of healing throughout your dog’s cancer journey! Be peaceful, be compassionate, be Reiki. Thank you. My dog has a large tumor and a couple of small ones. He is a beautiful soul and I want him to be comfortable and to feel loved not afraid. My 10 yr old beagle has thyroid cancer and had a baseball size Tumor and left thyriod removed I was told he may need treatment .and my 13 yr old shih tzu is in congestive heart Failure and gets seizures can this method help both boys? Hi Stephanie, Reiki practice is helpful for any and every condition – it is possible to heal, to become whole, in every moment – healing is much deeper than just the physical 🙂 Blessings! My 6 year old mini schnauzer has cancer in the lymph nodes and I was wondering how can I go with this if I want to try to heal him. We doing all the treatments we can, will this work or have you experienced this yourself. How did Reiki help your own dog exactly? Full recovery or emotional assistance only? Hi Deb, Reiki is not a physical cure – unfortunately there is no miracle cure for cancer that I know of, and I wish I could say that there was, and believe me I’ve looked. It is a very complex disease with many facets. Reiki is about finding healing and wholeness in every moment – and this is possible even amidst illness. Reiki is a spiritual practice that we as caretakers do, to walk through the most difficult parts of our dog’s journey with peace and balance. There is no greater healing we can offer to another being than our peaceful presence. Our dogs are very aware of our distress and grief, fear etc. and it makes things even more difficult for them. Being able to practice Reiki with my dog while he had cancer, in other words – finding peace and love and gratitude even in difficult moments – made a huge difference in his quality of life, and was a huge comfort to him during illness, hospice and in his transition. He also never developed any of the common side-effects from the medications he was on, which I attribute to Reiki. He had a big appetite (his favorite thing in the world was food) up to his last day, and I find that a huge blessing. Because of my Reiki practice, I was able to see his beautiful inner light, rather than only seeing his illness, and that was also a huge gift. Reiki also helped me through my own personal cancer experience – and I honestly don’t know how I could have gotten through it without the peace that Reiki brought to my inner being. Our illnesses do not define us – we are so much more! I do write about my dog’s journey in my book Reiki for Dogs. I wish you peace and healing with your dog! My 2 yr old dog has lymphoma – we are doing the chop chemo program at Angell Medical in boston and I would like to do Reiki to supplement. I’m having a hard time find a reiki healer for animals in Boston. Would you possibly have any contacts.